Read about the inspiring work of alumna Jazmin Morales (Sphinx Lead Fellow) featured on KPCC. I sat before the computer screen, my hand hovering above the keyboard. I was nervous before hitting that irreversible submit button. I paused, reviewed, and took a big breath. Click. The moment I wrote and submitted my first grant proposal for Tomorrow’s Filmmakers, Today (TFT) was filled with a mix of accomplishment, relief, and utter uncertainty. I had done my best and the decision was now in someone else’s hands. This was how I experienced my first grant proposal submission. TFT is a professional development program for emerging Latino filmmakers in Los Angeles. Over the past two years, I have been the grant writer for the program. Securing funding for any artistic program always feels like a longshot. But it turns out that we are not the only ones passionate about supporting these emerging artists. First, we received the Eastside Arts Initiative grant. A year later, we received a FilmCraft Grant Award from the Academy of Motion Picture Arts and Sciences. Writing and being awarded these grants has allowed us to spark change I had only dreamed of. This has been a professional and personal journey that is both fulfilling and challenging because I get to work for a project I deeply believe in and play an active role in how the program is coming to life from its first inception to fruition. The subject also hits a personal note: I am a bilingual and multicultural immigrant who rarely sees herself reflected on the screen. Most characters tend to portray stereotypical versions of immigrants and Latino people. I now have the opportunity to make a difference on how film and television tell our stories. After successfully securing funding for the first and second years of TFT, I was invited to participate as Program Coordinator. I was excited to play a hands-on role in the logistics and implementation of the Latino film initiative. I got to meet and work with talented creators who are passionate about telling their own stories; their commitment is contagious. I was boggled listening to the many challenges facing Latinos in the film industry. Creatives talked about being considered a person filling a “quota”, being pigeonholed, being asked to make their characters more mainstream, and being told what kinds of stories they could tell. We all felt empowered to make a difference by knowing more about the industry, ourselves, and how to overcome some of these barriers. "We can break down obstacles with our commitment and passion." It would be naive to think that one small program can change a whole industry. However, if we can help underrepresented groups navigate the industry, build the right opportunities to network, expose and spark the needed connections, then we are on the right path to effecting much-needed change. We can break down obstacles with our commitment and passion. Being a part of TFT allowed me to link my professional and academic lives through a hands-on learning process. During my time as a graduate student in Arts Management at Sotheby's Institute of Art-LA at Claremont Graduate University, I learned how to tell the story of an organization; and I learned that fundraising is about more than just dollars. Philanthropy is ultimately about connecting people through narratives and ideas. Securing funding for TFT would not have been possible without the knowledge and feedback I got from my thoughtful professors. I now have a deeper interest in philanthropy and funding projects that have an impact on equal access and representation in the arts and media. I feel encouraged to continue creating inclusive projects that transcend borders and build bridges among different communities. After all, what are we but the stories we share and create together? Ines Familiar Miller is an alumna of the Arts Management Program, and is a Program Associate at the California Community Foundation in Los Angeles. Ines is committed to social justice and to increasing participation in arts and culture. She aims to lead positive change by affirming inclusion and promoting equity in the arts, culture, and education. Note: This is reposted with permission of Sotheby's Institute of Art. It is a part of a blog series on student and alumni insights edited by Amy Shimshon-Santo. 10 Sotheby's Institute of Art-LA students, 4 lecture presentations, 2 performance experiences. MA Arts Management students, Olivia Schafer and Cailin Nolte, offer a behind the scenes glimpse at one of LA's leading performing arts centers. Ten of us arrived in the theater parking lot on a Friday morning expecting it to be empty. It was unseasonably warm and sunny for an October morning by the beach. This was the first day of a month-long intensive offered by The Broad Stagethrough Sotheby’s Institute of Art-LA. The Broad Stage is a performing arts mecca in Santa Monica that presents local and global artists working in dance, theater, music, and spoken word. 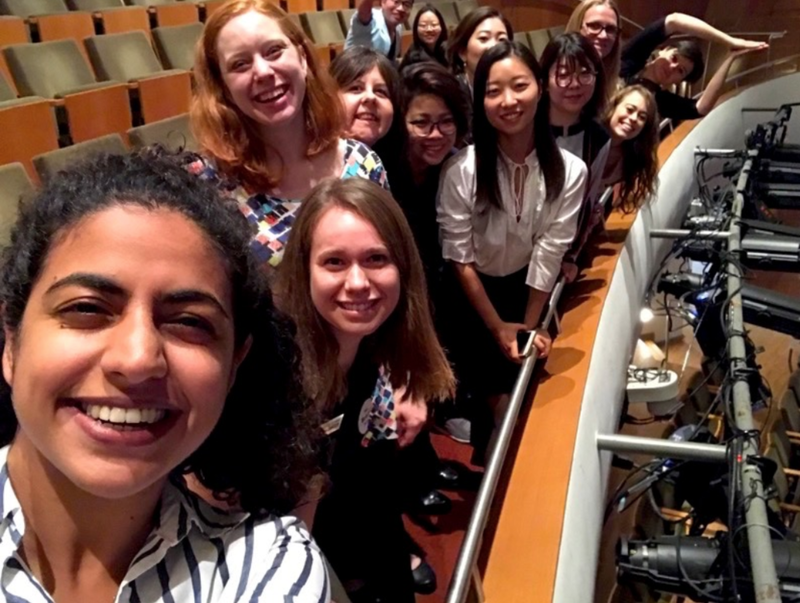 In our first semester of graduate studies, we were eager to explore the inner workings of a performing arts center and learn more about performing arts production and presenting. That morning, we were greeted by a cacophony of sounds, a flurry of movement, and an undeniable sense that something exciting was about to happen. Hundreds of elementary school students unloaded from buses and lined up along the shaded entrance to the main stage theater. An efficient team of production staff armed with clipboards and headsets ushered these youngsters into the air-conditioned theater. While we collected permission slips, and directed children to bathrooms, we got a taste of the preparation needed to keep kids safe, engaged, and eager to learn through the arts. Seated in the mezzanine, we witnessed the sea of squirming elementary students below us transform into a rapt audience at the call of a soulful trombone.Jazzy Ash and the Leaping Lizards had arrived on stage. Jazzy Ash and her band perform Louisiana Jazz to elementary students across the country in participatory arts experiences for children. Following the show, ushers strategically guided the students out by class and loaded them back onto buses while their colleagues prepped the theater for their evening show for adult audiences. The Broad Stage has developed robust programming for public school students across the county and encourages community building through their Family Circle Program. We spoke with the Education Team and we were surprised to learn just how much of a role curriculum development plays in curating, presenting, and programming a show. As educators ourselves, we have both written arts education curriculum and were intrigued to see this through the lens of a professional theater. This opened our eyes to the possibilities of community engagement. We can both bring the arts to students in classrooms, and bring students to the arts in theaters. Carolyn Elliott stood in front of us and enthusiastically described the direction of The Broad Stage's programing, as envisioned by Director Jane Deknatel. She posed this question before launching into a transparent discussion about the obstacles the organizations faces daily to fill all the seats of a 500-seat theater. As Director of Programming, Carolyn is cognizant of changing trends in the industry and works in concert with Jane to ensure both artistry and diversity in everything they put on the stage. She shared their innovative methods for balancing the season with both smaller and larger productions, as well as creating new subscription models. Carolyn’s joyful passion and the theme of collaboration resonated strongly with us. Her energy and solution seeking inspired us to think critically about our future careers in arts management. The Marketing and Development Team described their process for setting the theater up for success. They often plan two or three seasons at a time. Much to our millennial surprise, digital marketing, while cheapest, wasn’t always the most effective. In sound bite form: traditional advertisement works. In a demonstration of teamwork, we were invited to practice these creative marketing and communications skills by designing a marketing campaign for an upcoming show! Afterwards, we split into two groups, sat across the long conference table, and pitched our campaigns shark tank style. About halfway through our brainstorming session, Mark Rice, the Director of Marketing, threw a curveball altering the parameters of the campaign. With the two groups yelling over each other, we were challenged to think outside of the box and adapt to a real-life dilemma. Feed the volunteers. Feed audience members with a reception. Feed the community with knowledge. Feed organizations with values and ethics. Anyway you slice it, feeding people is part and parcel of a successful presenting business. We were startled by the uphill economic battles many nonprofits have to surmount to keep themselves from starving. Many die in the first, third, or fifth year. For most nonprofits, feeding others is how they keep themselves alive. After the production presentation about organizational survival, we got to see the team in action as they conducted the behind the scenes set-up of the blackbox theater for Impro Theatre’s Horror UnScripted. The up-close-and personal performance by a small troupe of hyperbolic and gregarious actors left us all spooked and impressed. From large-scale main stage theater to an intimate black box space, The Broad Stage is a model for education, performance and community outreach. Ilaan Mazzini, Director of Education and Community Programs at the Broad Stage, said about the intensive, “I really enjoyed meeting people interested in the same profession that I’ve been passionate about and helping facilitate an experience so that they can make decisions about the future.” The Broad Stage’s unique relationship to Sotheby’s Institute of Art-LA has empowered us to deepen our connection to the community, delve into the mechanics of running a theater, and identify our own place in the field. We’re thankful for the opportunity to network, grow, and imagine new ways of managing the performing arts. Olivia Schafer is a dancer, choreographer, and producer with her sights set on performing arts management. After receiving Bachelor’s degrees in World Arts and Cultures/Dance and Communication Studies from UCLA, she is pursuing her Master’s in Arts Management at Sotheby’s Institute of Art-LA at Claremont Graduate University. Cailin Nolte was born and raised in Albuquerque, New Mexico. She studied Music Education and String Pedagogy at the University of New Mexico and Boston University. Well versed in designing curriculum and coordinating events, Cailin is currently pursuing her Master’s in Arts Management at Sotheby's Institute of Art-LA. This experience was made possible with the generous support of The Broad Stage’s senior staff, including: Ernest Figueroa (Producer), Carolyn Elliott (Director of Programming), Eric Bloom (Director of Artistic Planning), David Coscia (Director of Donor Relations), Mark A. Rice (Director of Marketing & Communications), Ilaan Egeland Mazzini (Director of Education & Community Programs). Note: This is reposted with permission of Sotheby's Institute of Art and Arts for LA. It is a part of a blog series on student and alumni insights edited by Amy Shimshon-Santo.